Do you struggle with the removal of persistent smears, water streaks and dust build-ups from your windows? Do they cost you too much elbow grease and you don't want to take part in this chore? This process will no longer consume a lot of your time and efforts! The specialists of window cleaning in Colney Hatch are going to give you a hand! You will be able to use your leisure time as it fits you – the fully instructed and reliable professionals will take care of the sweeping and scrubbing. We offer thorough cleaning services for all kinds of windows. Read on and discover more about the different perks you can enjoy. We also provide our professional services in nearby areas: Woodside Park, Muswell Hill, Cranley Gardens, North Finchley, Wealdstone. You can rely on the team - they are the true specialists of window cleaning. They all have passed through complex training, so you can get efficient help for all glass surfaces kinds. What we can clean includes: small, double, sash or bay windows, garden windows, patio doors, French doors, greenhouses and roof windows. Your property can become better quickly with our aid. Call us every time you need efficient window cleaning for your home or workplace. Improve the look of your building – the specialists of commercial window cleaning will take care of that. As part of our distinctive service, we use water-fed extension poles. With this technique, we can clean entirely the exterior of your business premise, as high as the fourth floor. To reach highly-rised windows we use rope access. We make sure your windows will look pristine, no matter how highly placed they are. With the help of the squad of experts London's skyline shall never be dirty. We use the most advanced methods to make sure that you receive highest quality window cleaning. With our water-fed extension pole system and high pressure cleaning methods, you will enjoy crystal clear look of your glass surfaces. We connect our poles to water reservoirs in our vehicles to ensure that there is no danger for the exterior of your residence or business premise. For high-rise windows, we employ entirely secured rope access method. You can profit from these cleaning techniques now – just ring 020 3746 3113! 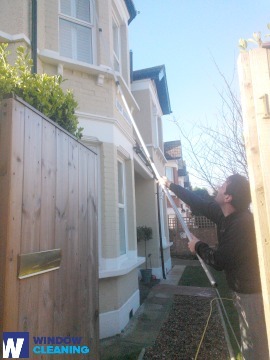 Benefit with our quick and dependable domestic window cleaning in Colney Hatch. We will clean the windows of your house both inside and outside. The solutions we use are eco-friendly - you will enjoy the perfect results and be ecologically responsible. Moreover, we use only purified water. Don't hesitate, dial 020 3746 3113 and order our second-to-none services. Our customer care staff will guide you – they are active 24/7. Another ways of booking – our request a cleaner online form or just chat with our operators.